Greys Artstone is a hand-crafted, reproduction stone slate that offers numerous benefits versus traditional, or generic, stone slate. The key advantage to this material is its exceptional durability and strength. It is also completely non-combustible and is fixable to a wide range of roofs no matter the pitch. We have extensive experience working with this material. Greys Artstone produce two products: Reproduction Stone Slates and Reproduction Slates. These mimic the properties their names suggest. 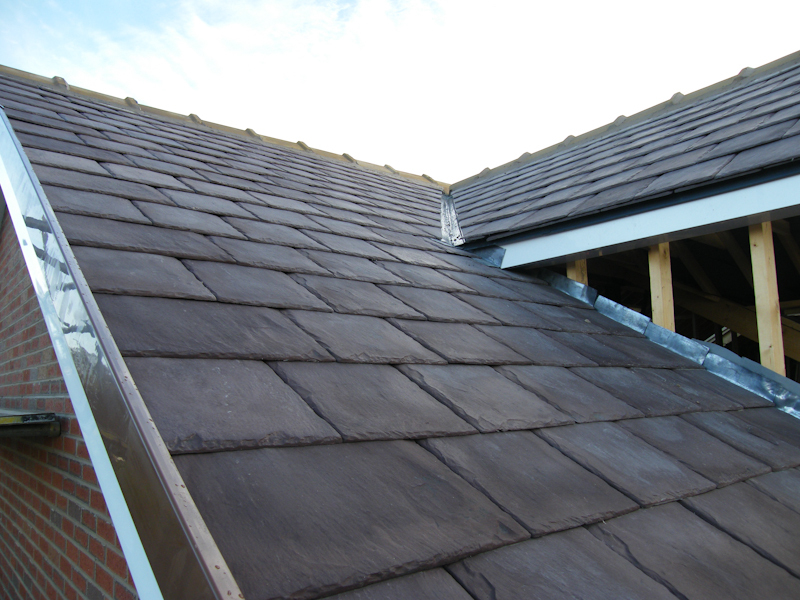 Both products conform to or exceed British Standards, which is why we’re happy to use them in roof construction. Artstone is also superior to natural stone in a few key ways. Firstly, it is lighter, weighing approximately 75kgm2. It is also safer to cut and is less prone to breaking. This reduces the material cost and improves roofing efficiency. Unlike lesser products, Artstone weathers like stone and not concrete. Concrete ‘greys’ or ‘washes’ out over time. Artstone does not. It also better resembles stone when cut, which is one of the biggest downsides to concrete. Because of this, we recommend Artstone as a more natural-looking, quality alternative to concrete. Another benefit to Artstone is its 25-year guarantee. This guarantee covers the product for all manufacturing defects. It is also a guarantee of strength, durability and robustness. This is among the best guarantees in the industry for a material of this type. The appearance of Artstone is very similar to that of stone or slate, depending on the product you choose. In fact, many people cannot tell the difference. This makes it suitable for roofs on period properties which are Listed. When properly installed, Artstone gives an authentic roofscape and it is designed to diminish, which means the slate lengths reduce up the roof slope for a traditionally authentic appearance. If you are interested in a stone slate or slate roof for your property, Artstone is a modern material you should consider. We’ve installed this material on many properties and we are always impressed by the quality and finish of the product.